By some strange omen, I wake up to BBC TV advertising a new show called “Connecting the Dots” and I pause to look at the graphic of the world rotating and their reporters connecting across the globe in Africa, New Zealand, Asia. Synthesis, I think, ingesting massive amounts of noise and putting filters on it like your sink strainer to capture the gunk, that’s what reporters do. On Hablaguate and HablaHonduras, everyday I filter the noise of Tweets, blogs, newspaper RSS feeds, Facebook group invites, Skype chats, CNN, Telesur and radio streams galore. By noon, it’s time for a different kind of noise, so Brad and I head out on our first walk into Antigua, before the afternoon rains. It’s growing more humid by the hour so we walk quickly into the plumes of black smoke from the Pana bound buses. We’re combining exercise and one errand: to pay the electric bill. Seems simple enough, except it’s something you can only do in person because like many things in Guatemala, people don’t answer the phones. In this way I feel like I live a double life of efficiency and inefficiency. Can we call their supervisors to oversee the process, I ask? “No, porque no hay una linea, no hay un proceso que le puedo gesionar. Es el mismo sistema que no podemos avancar.” Meaning, there is no oversight or process that I can guide you through, but she has their cellphones (which she can’t share with me) so she will keep calling until someone answers. Does email work, I ask? “No señorita, they don’t answer those either.” I tell her there’s GChat on the RENAP Web site and that I just got on it and someone in Morales answered and said: “Try calling a different day.” She is confused, so she tells me the story of a man she knew who it took months for him to get his information online in their database. “I think it was finally done because he went to Morales (7 hours away!) to personally request it. I would recommend you do the same thing.” I take this in and see her thinking behind it. Now this is balancing act, I tell her, because we want to model doing things the way that RENAP is trying to set a standard for right? By me going in person doesn’t it mean I am going back to an old model and undermining the newer, more standardized way of doing things? Silence. “I understand your point, señorita, but there is no other way.” I tell her we can blitz Krieg and clear the way for those ahead of me doing the same thing in Morales. I tell her I am patient and I will call her and all the RENAP folks involved everyday because it’s in my Google Calendar and the pop up window is irritating enough for me to call. I tell her I am a reporter and am not afraid to call over and over and over and over again. She laughs. One hour later as I am walking to Antigua, Duny, calls me again with good news: “You’ll be happy to hear that you’re online, señorita. On Monday you can go to Jocotenango and get your DPI.” Sometimes the gods punish us by giving us what we want. As I walk into town with Brad the humidity makes the collar of my shirt like an old scratchy corncob. But I get into it, I’m from here, this Guatemalan body was made for walking, scaling mountains even back in the day of the ancestors. On 5th Ave I ask a few people on the street where they pay their electricity and they point towards the Banco Industrial hole in the wall entrance that only has an ATM and tunnel like passage with a defunct metal detector and a security guard with a an AK47. I tell him I am here to pay my “power” and not electricity (after being corrected a few times) and he scoots me over to one line. The line moves fast for the people with their paper bills, but I do not have one, I am paying our landlady’s bill and she lost her paper trail. I tell them her address and all the identifying info for her and they smile and shake their heads. “Disculpe, solo podemos utilizar el contador.” We can only use the meter number to identify her house and the bill. I point at their computers and ask if they can’t find her in the database. No, they tell me, those are only for keeping meters and costs incurred by meter numbers. “But numbers are made of people,” I tell them and ask is there no way to connect her to her address? Well, maybe they tell me, but I have to go to the BIG Banco Industrial and the MAIN Empresa Electrica. At this point Brad is about to take a Tuk Tuk home, but I ask him to go along with me so we can figure out how things are connected. At the BIG bank we move through line quickly and we get to the teller and ask to pay the bill. “Do you have the meter number?” She asks. I sigh. “I had a feeling you’d ask me that.” She sends me upstairs, but before I go up we ask about where we can pay online so we don’t have to go through this again. She doesn’t have the Web address, but she informs us that as long as we have a Banco Industrial account, we can pay online. But what if you don’t I ask? She shrugs, we move upstairs as the storm breaks and the skies weep from the weight of it. Upstairs at the BIG Empresa Electrica, I expect a computer-lined hallway with massive databases. A security guard, also with a gun, greets me and so I tell him we need to connect a person to her address to get her meter number and then pay her bill. She walks me over a few inches to the phone next to him and dials customer support for the National Empresa Electrica. Brad sits down and watches the rain come down. I wait and wait and go through two attempts to connect her name to her address to her meter. “Favor de asegurar que ese es el nombre del la dueña.” But that is her name and that is her house and everything is under her name, I inform the representative. Well, I’m sorry, he tells me, but she does not exist in his system. I tell him, just try one more time, but just by street to find her name. “I’m sorry, señorita, but then you would get someone else’s bill and that’s private information.” Now, I tell him, do you think I would really pay someone else’s bill if you pulled it up and that didn’t match her name? I tell him to look one more time but just by her street name. He refuses. I ask him if he likes baseball. He says, yes, of course. Then strike me out, I tell him, give me three chances and if on the third try nothing comes out then I hang up the phone. Silence. “I’m sorry, I looked under her street name, and she is not in my system. I guess that means you’re out, too.” Yes, I tell him, fair is fair. Posted on Saturday, October 17th, 2009 at 12:16 am. Filed under: Blog, Team Guate Tags: calls, RENAP, transition	RSS 2.0 feed. Things here are no different than in the U.S.; there is a system and a process in each place which makes sense to the people who live in each place long enough. It would be very difficult and complicated for a Guatemalan who has lived all her life here to figure out where to pay “el recibo del luz” in the United States. She would not know where to call and when she eventually is told that she can pay by check, she would roll her eyes and say, I don’t have checks because I don’t have a “cuenta monetaria”. Pay online then the clerks would suggest then and she would asked “how do I do that?” After she’s given the web address, she then realizes that she doesn’t have internet access, or credit card or even a paypal account to pay. 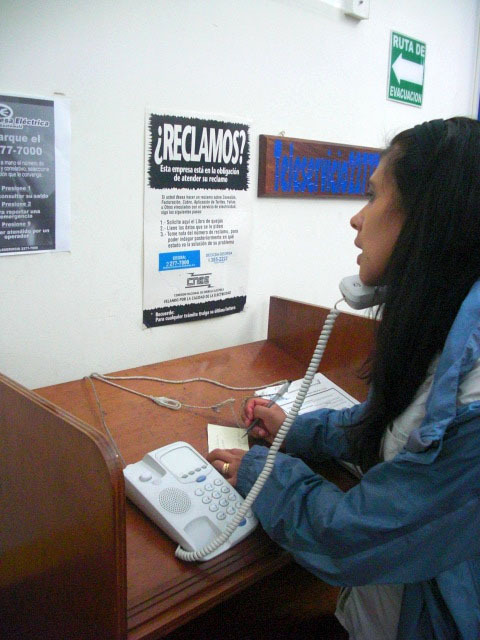 Finally, after several weeks of frustration she would ask her Guatemalan friends or relatives to help her out pay the bill for her. See, something that my seemed to be perfectly logical for that people who live there is totally irrational for someone who just arrived there. Having said that, here like in the States, you have to have the account number to be able to pay bills or get refunds. The account number here for the “recibo de luz” is call the “correlativo”. The only four ways to find the “correlativo” (account number) is writing down the electric meter number (the easiest of all); providing the NIT number listed in the “factura” (NIT is your Tax Id Number and factura is an legal taxt invoice); three, providing the actual name of the account (simple if you know it, but sometimes the account was created by someone else, like the residential developer, et al); last but not least, if you provide them with the cedula number of the person for the account. With a printed copy of your factura, before is overdue, you can pay at any bank, some pharmacies, supermarkets, special public utilities booths, et cetera. As you can see, there at least a dozen ways to pay your electric bill if you know the system and the processes. Easy fácil does it all the time! Also, regarding the RENAP, I believe the name of your best friend is actually Dany, short for Danilo. I believe the biggest problem for the RENAP in your case is that you were born in a remote village and it takes them a while to get all those archived documents scanned. Having said that, I believe the RENAP worked pretty fast in your case considering the previous piece of information and RENAP has only recently opened its doors and they are still ironing out all the wrinkles in the transition from archived documents in the local municipalities and the new centralized population digital data base. The official transition period is supposed to last a little over two years. I wish you good luck learning the systems and precesses which make living in Guatemala a pleasure. Remember, while in Guatemala, do like the Guatemalans! It seems as every turn in the road that has anything to do with Guatemala has another horror story. I am one of those souls born of a Guatemalan Mother and a US Father (both now deceased). I have been dancing with the devil for three years trying to find someone who can possibly help em get a birth certificate from Guatemala. Writing the Guatemalan Consultae in Atlanta, Ga. Well they don’e answer phones or respond to emails either. Getting an attorney contact in Guatemala City, first email 6 months to respond. 2d email six months to respond, 3d email, well it has been over a year and still no response. Oh well, I think I will do something simple like do tax returns for the rest of the day and try the Guatemala Shuffle again tomorrow.